Sabudana Wada is my all-time favourite Maharashtrian dish! Sabudana" is the Marathi word for white pearl like beads of sago. Sabudana is called "javvu arisi" in Tamil .In Mumbai and in Maharashtra, there are a lot of places where you get hot, delicious Sabudana Wada. It is very easy to prepare. In Maharashtra Sabudana Wada and Sabudana kichidi are most common dishes made during fasting time. But I have never made it during a fast.... It is very easy to make with very little preparation. 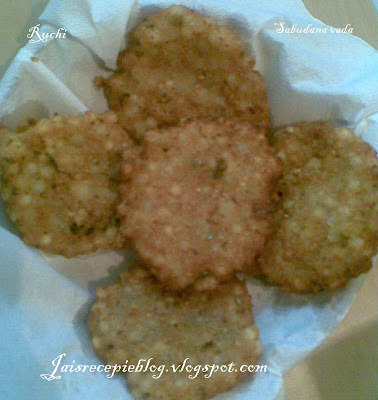 Sabudana Wada is such an awesome snack and too delicious ! 1.Soak the sabudana, in enough water to cover it, for about two hours.Drain off excess water. 2.Mix together sabudana, mashed potatoes, ground peanuts, chopped green chillies, coriander leaves, lemon juice and salt. 3.Mix thoroughly. Divide into sixteen lemon sized balls, flatten between palms of your hands. 4.Heat sufficient oil in a kadai and deep fry wadas in hot oil till golden brown. 5.Serve hot with chutney of your choice . i've never tasted vadai, (javvarissi payaasam yes :). the recipe sounds simple and good. 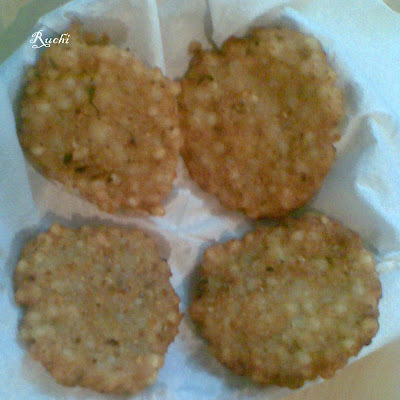 Yet to prepare this yummy wada, they looks to crispy...nothing to worry about the pic yaar, its looks good too! This is my favorite maharastrian food too Jaishree .. I make these too but not often. I always forget to soak the sago, so never got to cook. Looks yum, I do love the taste. This looks lovely...need to try it sometime soon. That looks crispy and yummy jaishri. yum yum..my amma used to make these when i was a kid. used to love it. My fav vadai.. looks really mouthwatering..
That was so nice of Anu to help out with the photo......bad photo happens to all of us....bad photo or not the vadas look super yummy. looks soo good and pic are perfect..not to worry of that...bet it would have surly tasted delicious..
does it usually soak a lot of oil.. mine did.. did i do something wrong?? Thanks for the good recipe given with pictures of yummy Wada's. I live in Hyderabad and prefer making Sabudana wada using ready-to-cook Actchawa Sabudana Wada, which I generally buy from spencer’s Store. I will definitely give your product a try but not during fasting because Coriander powder does not go during fast. Sometime you may also try Actchawa Sabudana wada ready-mix, the information of product is available on http://www.actchawa.com.